Support from the private sector — from parents, families, and local businesses — is essential to achieving the educational and developmental goals set forth for our children. It comes in a variety of ways, from volunteering one’s time and resources to financial donations. The most important aspect, however, is also the simplest: Play a role in the success of our students! The following Success Stories demonstrate how others in the community have already helped provide a dynamic educational environment for our kids. Please take a moment to reach out and discover ways in which you can make a difference within the Burbank school community. Click here to see a map for the school nearest to you and the link to their website for information on how you can get involved. The 2016 McKinley Elementary Community Fair and Open House is scheduled for Thursday, April 28th at 5:30pm. Learn about programs in your community, enjoy some fun with your fellow McKinley families and visit your child’s classroom to see what they have done this year. It is also a great opportunity to visit future grades and see what you can expect! On your marks! Get set! FUNDRAISE! 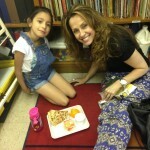 Disney VoluntEARS are matched with first and second grade students to help bridge the literacy gap. Weekly reading sessions take place at the school during lunch and there are currently 28 students in the program. The goal is simple – help develop young minds and instill a passion and love of reading! You can also check out a video of their success by clicking here. 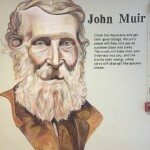 Through a partnership with Logix Federal Credit Union, John Muir Middle School has installed their Hall Of Heroes in the 100 hall corridor of the main building on campus. The Hall of Heroes is a series of murals that includes portraits of fifteen historical figures – ranging from Theodore Roosevelt to Harriet Tubman to Little Richard – painted by local artist Randall Williams. The portraits include quotes from the heroes and provides true art in the center of campus. 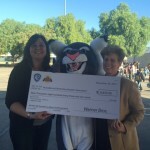 Providencia Elementary dedicated the month of October to raising money for their Music Program, and Warner Bros. offered up a challenge grant – the studio would match every dollar raised up to $10,000. Providencia families and friends rose to the challenge and donated $9,833, so with the match, their fundraising total for the month was $19,666!! The money will be used to purchase new instruments, and introduce the recorder and ukulele to the 3rd, 4th and 5th grade classes. That’s in addition to the already existing violin and cello program offered to 4th and 5th graders. Great work, Providencia! 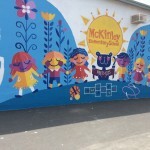 McKinley Elementary students started off the school year with a colorful addition to their campus, a new mural painted by Nickelodeon interns or Nickterns as they’re called around the animation studio. Each Nicktern class is required to complete a philanthropy project, with a number of previous classes having chosen to Support Burbank Schools by painting murals at BUSD elementary campuses. Carson Smith, who heads up Nickelodeon’s Community Efforts and Amy Wu, the Program Manager who oversees the Internship Program met with Principal Liz Costella earlier in the summer to discuss the idea of Nick painting a mural on the McKinley campus. The project was then handed over to the Nickterns who designed the mural, pitched the idea to Principal Costella and eventually braved the late August heat to complete the mural right before the school year kicked off. “The intention was to represent teamwork. We want the students to look at the mural and be inspired to work and play together,” said Nicktern Lauren Patterson, who designed the mural and is currently studying at the Art Center College of Design in Pasadena. The mural was formally unveiled with a school-wide assembly on Thursday, August 20. 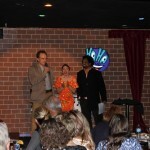 Providencia Elementary School’s 2nd Annual “Save the Music Comedy Night” took place on Sunday, May 3rd. With 140 tickets sold and a full house, parents and friends enjoyed a wonderful night of comedy with an incredible line-up of hilarious comedians- Zoe Rogers, Marcella Arguello, Jeff Richards, Amy Anderson, Tony Baker, Danny Vermont, Don Friesen, and Vargus Mason (Prov Parent and producer of the show). After two hours of laughs, a live auction was held with celebrity guest auctioneer Naomi Grossman (“American Horror Story”) and Bradley Whitford (“The West Wing”). Disneyland passes, tickets to “Ellen” and a Nickelodeon VIP tour were among the items generously donated by local studios and businesses. Tickets sales and auction proceeds resulted in a very successful evening and $5,445 towards the Providencia Music Program. Providencia is the only elementary school in the Burbank Unified School District to provide a weekly music program to ALL students, and also teach 4th and 5th grade students to play the violin and the cello. Principal Partner Michael Cusumano and William McKinley Elementary School Principal Liz Costella teamed up to help the school community produce the first ever Community Fair and Open House, which was an opportunity to showcase all of the wonderful things that are going on at McKinley. The Hip Hop Club performed several dance sets, and the Garden Club, and fantastic arts program, were on full display! It was a great opportunity for Burbank organizations, such as the Burbank YMCA, Boys and Girls Club, BTAC, Kids Dental Clinic, The Gordon Howard Museum, and many others to network with and get to know the families in and around the McKinley neighborhood. 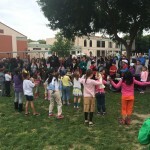 The event, which was attended by more than 350 people, was planned by a committee that included Costella, Cusumano, McKinley staff, and McKinley families. 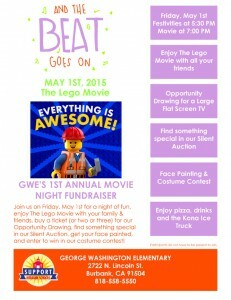 And the Beat Goes On – Join George Washington Elementary School on Friday, May 1st for a night of fun. Enjoy The Lego Movie with your family & friends. There will also be face painting, a costume contest, pizza, the Kona Ice truck and much more. Buy tickets for the Opportunity Drawing for a chance to win a Large Flat Screen TV. Come out and support GWE for a night of fun. Burbank Community Day School has been awarded a complete kitchen makeover from the Burbank IKEA store that will enable at-risk youth to prepare their school garden grown produce in their very own kitchen. This will allow CDS students to develop job and career skills in the field of Culinary Arts. “This is a great opportunity for our students to prepare nutritious meals from produce they have grown from seed in their garden. This encourages students to cook for themselves and their families as well as develop healthier eating habits,” said Principal Chris Krohn. IKEA wants to play a part in creating a better life for the many people, as well as communities touched by IKEA business. While IKEA works on a global level to improve the lives of people in developing countries, IKEA also wants to be a good neighbor in its local communities. The IKEA Life Improvement Co-worker challenge is one way to make a difference closer to home. Hundreds of members of the George Washington Elementary School community recently turned out for inaugural Family Math Night. Students and their families ate dinner at the school and played mental math games using decks of cards and dice under the direction of math consultant Nancy Paulson. 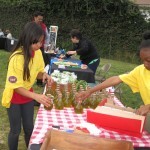 Stevenson hosted their first ever Schoolyard to Market Program. Much of the organic produce they sold was planted by Cartoon Network volunteers. They have had a Garden Club with Stevenson for over 8 years. 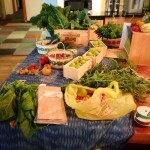 Thanks to all who purchased, planted and asked for more produce next time. You Are Special is the result of the Young Writers Program that started at Robert Louis Stevenson Elementary School in Burbank in 2010. Zita Lefebvre and Dave Smith of Cartoon Network Studios went to Jordan Middle School in Burbank and talked to the students about the process of animation. The students each received pencils and storyboard paper. The students were asked to write and draw a story related to bullying. The stories were judged by the teachers and Principal Stacy Cashman. Sherryn Sim, an 8th grade student wrote the winner, You Are Special. It is an amazing story about the effects of bullying. Sherryn met with Cartoon Network artists several times and was helped with her storyboard, color and design. The art direction came from Kevin Dart of Cartoon Network and he loved Sherryn’s drawings. Sherryn and three friends came to Cartoon Network to record the dialog for her movie. Tara Strong, voice of Bubbles from “The Power Puff Girls” volunteered to work with the kids. The session was amazing and the students were thrilled to meet Tara. Click here to see Sherryn’s video. Connect with a school in your neighborhood! Host a car wash with all proceeds going to your local school. Create a donation drive or a pledge event, such as a charity race or walk. If you have strong computer skills, offer your expertise for IT or website design support. Plan a school cleanup day, and include parents, teachers, students, and any community members who want to help. Find out how you can financially contribute to a school. Attend a school play or concert. Volunteer to drive or chaperone on school field trips. Help out in the school library with re-shelving books or assisting students. 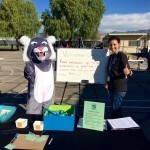 By supporting our students, teachers, and staff, Burbank Business Partners strives to develop a stronger sense of community and a healthy, safe and dynamic learning environment.